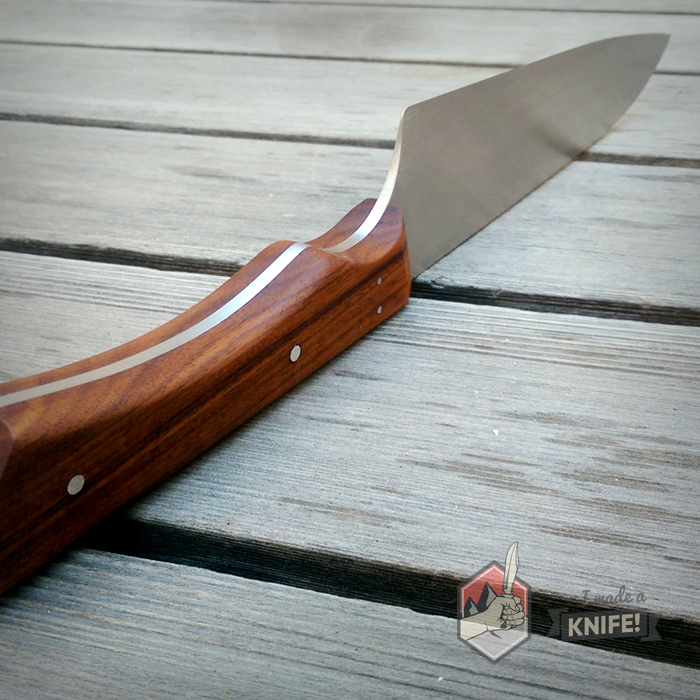 Crafting the Knife Handle - I Made A Knife! Find yourself some good hardwood or synthetic material. If you’ve found the wood on your own, you’ll want to make sure the wood is completely dry (6-12 months in a warm, dry place). 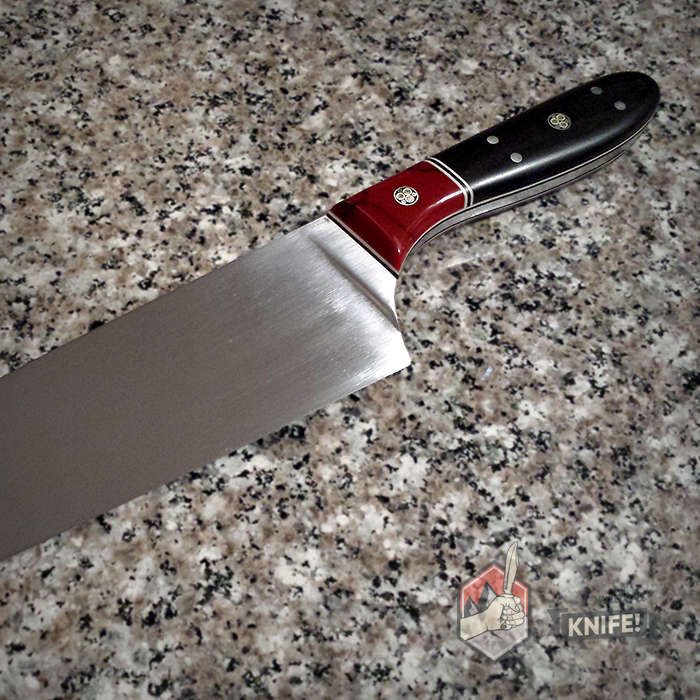 The size of the scales should each be a bit bigger than the final handle size and 1/4″ to 3/8″ thick. If your material is already in two pieces, then you’re ready for the next step; otherwise, cut the block in half to get your two scales. 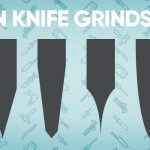 NOTE: before making your own handle, you can actually find some pre-made or dimensioned scales of various materials on the web if you’re tight on time. 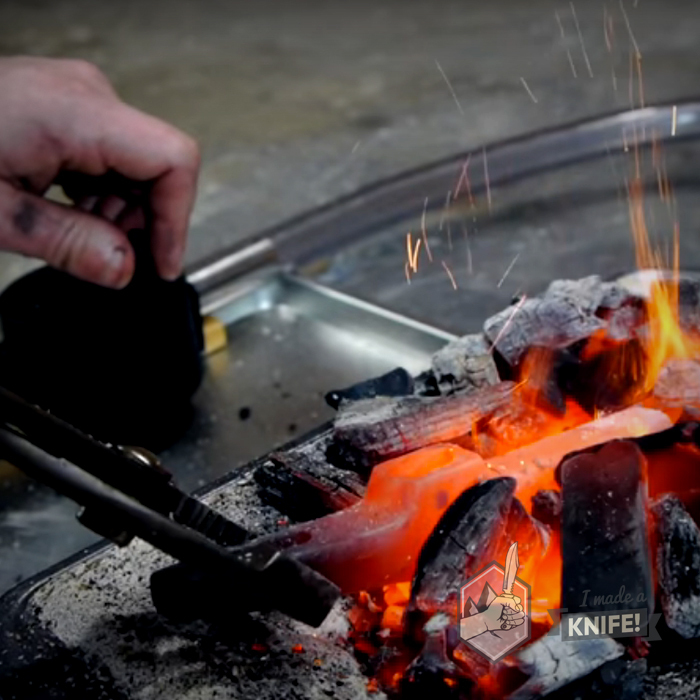 Place the tang of your knife along one or two of the outer edges of one of the scales so you waste as little wood as possible, clamp them together, and drill through your pin holes into the scales. Put some scrap wood as backing behind your scales to reduce splinters and cracks as you drill the holes. Once all your pin holes are drilled, trace the tang shape with a Sharpie onto the scale. Remove the clamp and do the same procedure with the other scale. Now cut out the rough shape of the handle in the scales by using whatever tools you have available—hacksaw, band saw, etc. OPTIONAL: to create a better epoxy bond with your blade later on, you can drill small recesses into the insides of your wooden scales—make sure they’re just shallow holes and don’t go all the way through. This will allow the epoxy to stay in the space rather than be squeezed out when clamped together with the blade. You can use any number of materials for your pins, but it’s important that they’re strong and match well with your choice of handle material. Brass rod is a popular option that you can easily find at a hardware store. Before inserting your brass rod into the scales or tang, sand down the ends of it with some 80-grit sandpaper to help smooth the ends for seamless entry into the wood. Insert your rod, through the scales and knife, into one of the pin holes. Now with a Sharpie, mark your cut line about a ¼” higher than flush. We’re going to cut the rod with that little extra bit of material so that we can file and peen it down later. Remove the rod and cut it to size with a hacksaw. Sand down the new end of the pin and follow this procedure to create the other pins. Before we adhere the scales to the blade, you’ll want to do some shaping and sanding that would be harder with the blade permanently attached. Leaving the knife out, put your pins through your scales and put the whole handle back in your vice or clamps. Now that they’re attached together, you can file and sand them more evenly. Just roughly sanding the handle so that the two scales are uniform. It’s important to shape the front-most part of your handle—the part where the blade and the handle meet. It’s very difficult to do with a knife in the way. It doesn’t have to be perfect at this point, but it will save you some time later on. Before your rough scales are ready to be attached to your blade for the final sanding, lay down a large piece of sandpaper and give the inside of each scale and good sanding to make sure they’re even and flat. 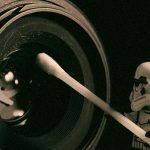 Depending on your choice of pin material, you might have solid metal or hollow tubing. 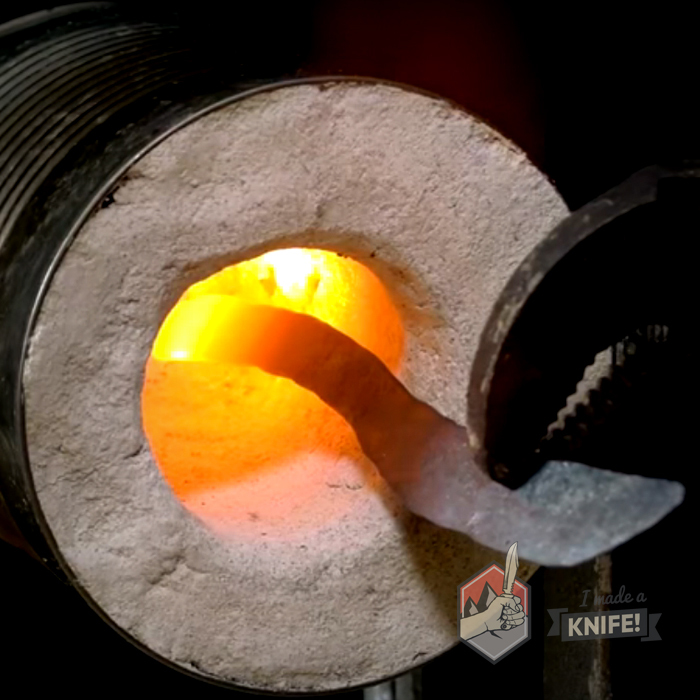 Hollow tubing will allow you to peen the metal and embed it into the handle to better attach it to the blade. 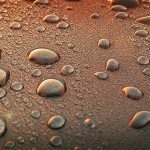 While pins and rivets are optional, epoxy is a must-have. Applying epoxy as well will not only strengthen that mechanical bond, but also stop moisture from getting in between and causing rust to form on the tang. Find a clean surface or tape down some parchment paper to your workbench, as glue can get really…glue-y. Remove the pins and separate the scales from each other. We’re going to mix up the epoxy and start the glue-up process. Start by degreasing and cleaning your knife’s tang using soapy water and a toothbrush or rag. If you’ve got acetone around, that will also help remove any left-over oils. Rinse and wipe dry; the epoxy needs a clean, dry surface to work with. To protect the blade area from the epoxy, you can tape it up with some masking tape. Use an X-ACTO knife to cut off any extra tape. Taping up the blade is also a good idea as it make the knife much easier and safer to handle. Now, insert your pins into just the tang of your blade. Start mixing up your 2-part epoxy on your flat surface or in a plastic cup. You can use a popsicle stick to apply some epoxy to the pins and the tang. Next, apply it to the inside of your scales with the pins still in the tang. Attach your scales to the pins using a rubber mallet if need be to get them tight into place, leaving 1/8″ of the metal rod sticking out on both ends. Once the handles are on and the pins are sticking out, clamp it all up. If you’re using clamps, it’s a good idea to put something between the clamps and your handle to protect it, like leather strips or cardboard. Ideally, you should see a bit of epoxy coming out along the spine of the metal—called squeeze-out—and it’s a good sign you have a strong bond. Wipe it away with a rag or some Q-tips with acetone. While you’re at it, make sure to clean up the epoxy around where the handle and blade meet. Let your newly glued up knife sit and set overnight. Your rods should stick out 1/8” on each side of the handle. Place your knife on a hard and solid surface and grab your ball peen hammer. Begin gently tapping the ends of the rods using the round side, moving in a circular motion—not hitting them right in the middle—so that the material mushrooms out. Do this for a couple minutes on one side, then flip it over and do on the other side. As you get closer to the wood, flip the handle more often. Once the pin’s metal is touching the scales, tap a bit more to recess it in the wood a little. Now you’re ready to begin the final shaping of the handle. With the tape still on the blade, place your knife back in the vice, blade-first, and start shaping the wood where it meets the metal tang. You can use any number of tools, including files, sandpaper, the 4-in-hand, or a rasp. You want to get as close to the tang as possible without tearing it up—you don’t want to dull your tools either. To get the wooden handle flush to the metal and shaped up all around, use a file to get as close as you can, then use sandpaper wrapped in a wood block for flat parts and PVC pipe or dowels for your contours. 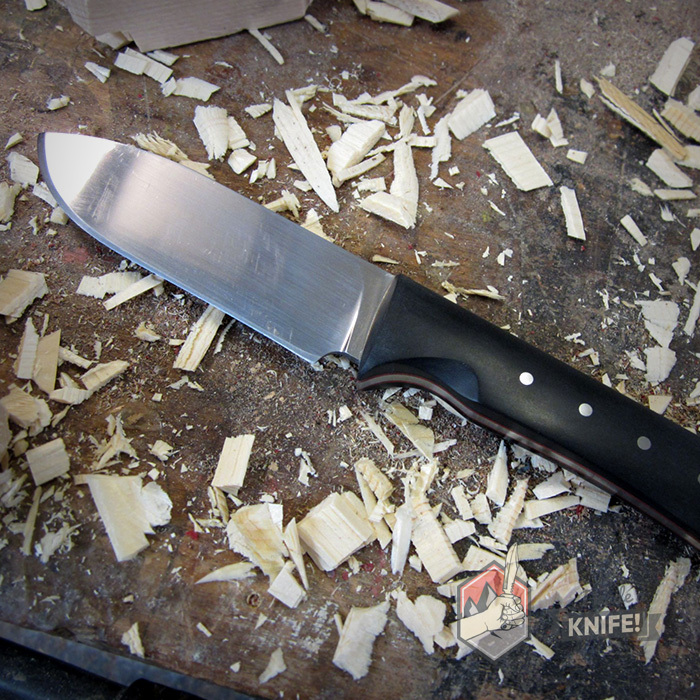 Start with an 80-grit sandpaper and begin smoothing the handle and its pins. Similar to how you sanded the blade, sand the handle by moving up in grits to achieve a finer finish. A 400 grit finish should suffice (you don’t want the handle to be slippery! ), but it’s up to you if you want to go further. 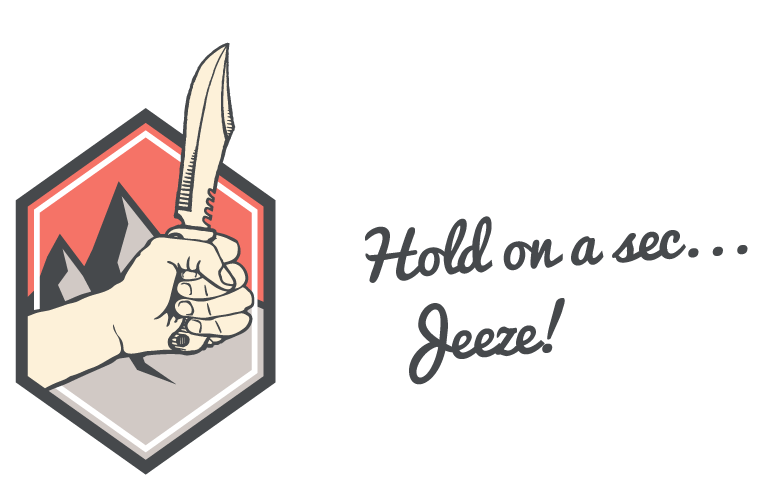 Take your time here, feel the knife in your hand as you go along, and enjoy the process. 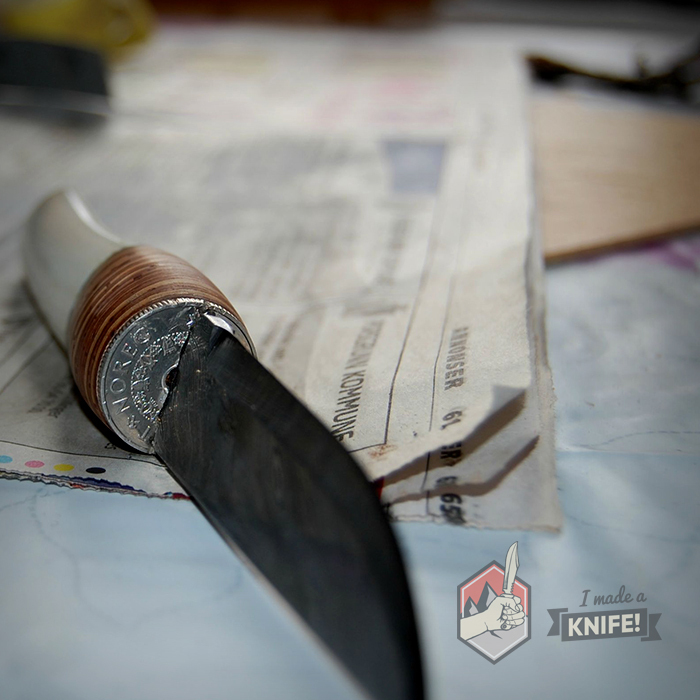 Once everything is all done and smooth, clean the handle off completely and finish it with a couple coats of tung oil—your blade should still be wrapped up—to bring out the richness of the colors and for protection.